No bottling date that I can see but very fresh, maybe two weeks old. A: Pours a mildly hazy, almost clear golden-amber. Big fizzy, fluffy off-white head. Head fades away slowly, leaving a nice island of foam behind. Nice fluffy spiderweb lacing left behind. S: Really nice tropical fruit. Pineapple, mango, apricot mainly. A little bit of onion/garlic in there too. Even get a little melon. Nice! T: Big, juicy hops. Loads of tropical fruit again but no sweetness, all bitterness. There is some grapefruit and resin in there now too. No sign of the malt, I think it perished underneath all the hops. Maybe some biscuity flavor in there...maybe. Another wave of bitterness into the finish. Drying, oily hop bitterness between sips. M: Medium bodied, carbonation a touch high I think. Drying. O: Well, this is Backlash's attempt at big west coast style DIPA. It's pretty good, but very unbalanced. Pure bitterness from start to finish. Almost no malt taste or sweetness. Not far from chewing on hops, which I don't mind at all. Drinkability does suffer a bit due to unbalanced nature, however so I couldn't mark it quite as high as I'd like. This liquid homage to Samuel Adam’s Hop Sharing program, which provided Backlash with Citra and Simcoe hops, is one hell of a DIPA. 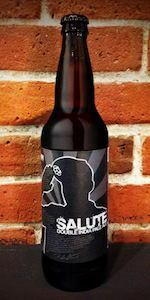 While it’s packed with hop character, and it provides a good kick in the palate, it remains flavor focused, and is surprisingly balanced and highly drinkable. Eggshell white head; two fingers thick. Leaves streaky lace off each ring. Mild haze chill haze to the golden color with a touch of green tint. Lots of pine and grapefruit rind to the nose. Powerful even as a bar pour. Flavor is strongly bitter--there's no balance to this beer. The body trends toward the thin side; the carbonation above average. The finish is similar to sucking a hop pellet. IPA drinkers will love this beer that borders on the extreme. A-Pours a cloudy honeyed hue. A giant head forms and grows. It also refuses to leave. It isn't too generous with its lacing. S-Oily, catty and onion. Rotted citrus flesh. Very oniony, almost like eggplant or asparahus; its cool. The malt really hides behind the eccentric hoppiness; its there but only because it needs to be. T-Becomes a bit more normal here. Citrus is bright and lively. The cat piss and onion are softened out. Tangy grapefruit and a bitter grassy finish. Malt is still subdued but it donates much more here than in the nose. Check that, as it warms it becomes quite balanced. M-A bit boozy. High bitterness. Booze dries and the bitterness grips the palate. Yet, the flavors are enough to combat the coerciveness of then beer. O/D-Not a fan of the label art or the entire mantra of Backlash. A silhouette of a bro with a flat brim hat is not very appealing but these guys are decent brewers. This is a pretty tasty DIPA, I'm a sucker for those. On draft at the Union Brewhouse in Weymouth. Appearance: This beer poured a small head that reduced to a small layer and left some nice lacing on the glass. It is a hazy orange yellow color with no signs of carbonation. Super nice lacing on the glass as the beer was drank. Smell: Tropical fruit heaven. Pineapples, mango, passion fruit, and tangerine. Caramel and bready malts in there too. Taste: Same as above with some nice subtle bitterness in the end. Tropical and resiny hops deliciousness. Mouthfeel: Smooth, tingly bitterness, medium carbonation, medium to full bodied, a little dry, chewy, and enjoyable to drink. Overall: Pretty solid DIPA. I had a few weeks ago on draft and enjoying it once again. Poured into a 13 oz tulip glass, could not find a born on. Pours a cloudy light orange with s half inch of off white head, that leaves some lacing. Smell is grapefruit, apricot, tangerine, mango, and some earthy grassy hops. Taste is citrus, Headyesk, with grapefruit giving it a bitter edge and tropical fruit mellowing out the edges. This is really nice, would drink this again no doubt.